It's been about a year since The Ramones made their first hit-and-run visit to England for a pair of storming gigs in London. At that time of pre-punk rock acceptance, they wondered how they'd go down with the rest of the country when they returned for a full tour. They needn't have worried, 'cos the tour was an unqualified success. The Ramones couldn't have picked a better time to come, what with everyone suddenly realising that high energy rock'n'roll can be more fun to like than to put down. Gigs have been sold out and crowds fanatical. The Ramones' rock cartoon, high-powered blitzkrieg is honed to fine perfection now. With hardly a gap between songs they machine gun the crazed punters with a devastating barrage of wall-to-wall powerchord rock. One of the most exciting acts around. 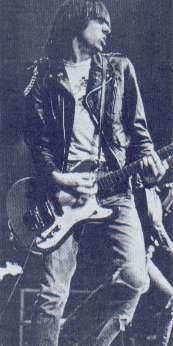 The Ramones have tasted chart success too, with 'Sheena Is A Punk Rocker' getting in the Top Thirty. Radio One even played it! I first caught the tour at Friars Aylesbury, one of the few dates on the tour not to sell out. That's 'cos the so-aware locals were probably dozing off to Steve Hillage. Still, a thousand mostly-out-of-towners who came went bonkers and brought them back for nine or more encores. It was a great set, with probably the wildest reaction Friars has ever seen...a raging sea of pogoers falling around with lunatic abandon in front of the stage. 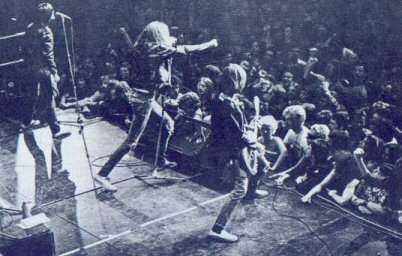 Anyone who stands still when The Ramones are on must have lead-filled buttocks. Everyone sang along, danced, stomped and had great fun (except for a poor Eagles' fan getting his first taste of raw power, who stood with his hands over his ears for the twenty minutes he could stand! ).The set went like greased lightening, the momentum being broken only when Johnny got in the way of a particularly large chunk of the gob raining on the stage. "I want him thrown out", he snapped to a roadie, pointing to the pogo-ing culprit. ("Nasty habit", Johnny said afterwards. "I don't know who started that, but you know, you play better if they don't do it"). After I'd recovered from the set, I thought I'd go and see what the band had been getting up to since their last visit. Blimey I was pissed! Good job I had the old tape recorder handy, 'cos I can't remember saying half the things on it'. Johnny was sitting in a chair in the corner of the dressing room. Last time I saw him after the Roundhouse gig there was blood pouring from his fingers (if you've ever seen him play you'll know why), so I enquired about the current state of his pinkies, and it turns out repeated string thrashing has toughened them. "My fingers are hardened up so much now that I can't even cut 'em", he Noo Yawk drawled. "They're like rocks. That night (The Roundhouse) there was blood all over my T-shirt and everything, the worst I've ever had it. People wouldn't believe it, they thought I had blood capsules in my fingers!" Gosh, the sets have got longer too, huh? "Great! Great! There's so many places to play in England it's amazing. You come to a town you've never heard of and you don't know how many people you'll have. This one there's a thousand...it's great". How's it compare with last year? "I hear we had some bad reviews over here last year" (Yeah, you did...from people with turds for brains.) "I thought we were good last year. We had a ball at The Roundhouse and Dingwalls. Now I have people come over to me and say 'Oh boy...big difference between this year and last year'. I say 'Whadya mean?' We were satisfied at the time. We would never do encores, it was against our policy and we did encores at both places. We'd never done encores before. They were clapping enough to make us come back. Now we like doing encores. We like to play all our stuff, and we need a little rest here and there". I notice a greater 60s influence creeping into the sound, specially on the single. "Yeah, that was as far as the single goes. That was because it was a surfing type song and we wanted to get a surfing sound on it. But that necessarily doesn't mean that is what we want to do all the time. They're all different songs". "Oh yeah, we've about seven songs. We're gonna go back and write the rest as soon as we get to New York and get it out as soon as we can. We wanna get back here as soon as we can too...it's great playing here". Whadya think of your record company swapping 'Carbona Not Glue' for 'Baby Sitter' on the new album? "It bothered us. I haven't had a chance to hear 'Baby Sitter' yet. I notice they didn't write the name on the cover. Some of us don't even remember playing it". "It wasted a song. You can't waste songs. There are fourteen and it's hard to keep writing fourteen, you know. Maybe we'll put that song on the flipside of a single sometime for people who didn't get it. Luckily we recorded fifteen songs. We'd saved 'Baby Sitter' till last". "I don't know. First time we heard it we didn't like it. We don't care. It's nice to be called something, otherwise nobody will know what it is. Everybody can be united by it - New Wave or punk rock - and be punks and have a cause". "No. Be punks and bounce up and down, but...now the whole thing is catching on fast, you know. It's real big in England. It's worked and the word can spread fast. It takes a long time for things to spread in the United States. It spreads from New York to California, but misses the whole middle. In America it's not really a movement. People come and see us and like us...they don't look on us as a New Wave group. We're just a group, but nobody's doing what we're doing in the States. "Over here there's lotsa groups instead of one group. If we were the only group doing it, they'd look at us like a bunch of freaks, you know".